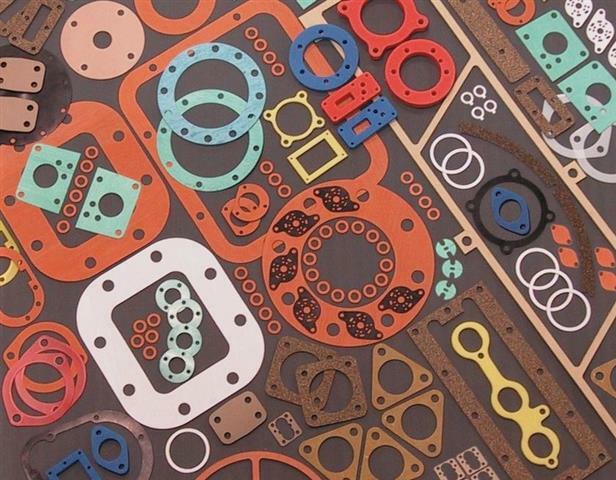 Delmar Company provides high quality, high performance ANSI-standard red rubber gaskets, as well as custom red rubber gaskets that are manufactured to match your unique specifications. Advanced Atom Flashcutter technology enables us to maintain tolerances as close as ±0.008” and to produce any custom gasket shape/profile you may need, no matter how complex. Working with the ANSI specs you require, or from your CAD, DXF, or DIE design files, we will create standard or custom red rubber gaskets that match your requirements. Request a quote or contact us for standard or custom red rubber gaskets for your application. Red rubber, also known as SBR or styrene-butadiene, is actually the general name for a family of synthetic materials with characteristics similar to natural rubber. Though car tires are perhaps the most common product made from red rubber, the materials’ varying durometers and characteristics make the SBR family a versatile option for a wide range of applications. Our team will work with you to determine what type of red rubber is right for your needs, or if another rubber gasket material is better suited to your project. Material selection is based on a number of factors, including process pressures and temperatures, chemical compatibility, sealing capabilities, and more. A: Application—is it a pump? a flange? a valve? etc. M: Media—what will the gasket prevent from leaking? For potable drinking water applications, we can produce your gaskets from special NSF 61-approved SBR material. Delmar Company is one of few companies in the industry that works with NSF 61 rated elastomers. Contact us to discuss your NSF 61 gasket requirements. If it’s made of the wrong material, your gasket can fail, causing equipment damage, personal injury, or worse. With that in mind, we do everything we can to ensure that the standard or custom gasket we provide is made from the best and most effective material for the job at hand. If we’re not 100% sure that the material we recommend will work safely in your application, we will help you find the right material, even if it means sending your project to a different manufacturer. We won’t sell you a product just to sell a product—if we can’t provide the material your application needs, we won’t sell you anything at all. Safety is always our top priority. Delmar Company is your #1 source for standard and custom red rubber gaskets. Request a quote or contact us today! We also offer Buna gaskets, neoprene gaskets, EPDM gaskets, silicone gaskets, FDA & NSF 61 rubber gaskets, Viton gaskets (FKM), open and closed cell sponge gaskets, and rubber o-rings in all elastomers.